More than ten colleges could be excluded from accessing apprenticeship funding because of their grade four Ofsted rating, FE Week can exclusively reveal. As part of a consultation on the new apprenticeship provider register, expected to be released tomorrow, FE Week understands the government will consider excluding ‘inadequate’ providers. 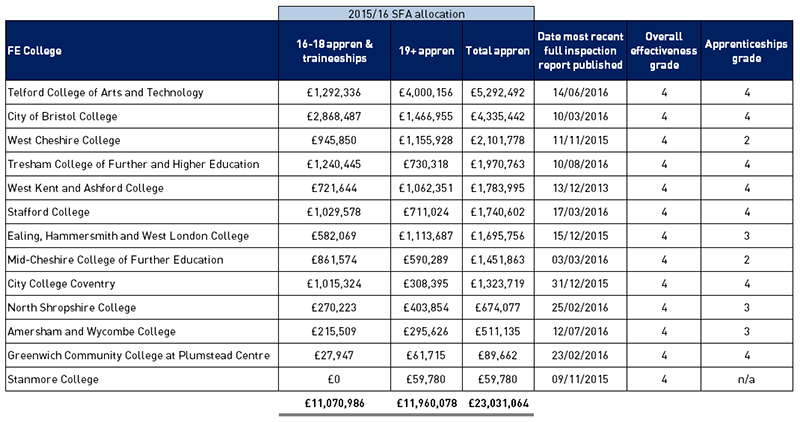 There are 13 colleges currently rated grade four with a combined apprenticeship allocation close to £25m, of which seven also have an apprenticeship specific grade four (see below). FE Week’s research focused on general further education colleges rather other types of provider, as former skills minister Nick Boles challenged colleges at the Association of Colleges (AoC) conference in November 2015 to go from delivering a third of all apprenticeships to two-thirds, and advised them not to let training providers “steal your lunch” when it comes to securing the government’s apprenticeship funding. FE Week approached the five grade four rated college that currently receive the highest apprenticeship funding allocations – Telford College of Arts and Technology, City of Bristol College, West Cheshire College, Tresham College of Further and Higher Education and West Kent and Ashford College. He added that the college’s position is “clear” on the government’s plans to potentially cut levy funding for grade four providers: “We feel that only education providers who demonstrate the highest quality – a grade 1 or 2 – should qualify for funding access. Telford College, City of Bristol College, West Cheshire College, and Tresham College made no comment. In addition, two colleges among those that are currently rated grade four and are also in the top ten for apprenticeship funding allocations have be granted a grade two rating for their apprenticeship provision. West Cheshire College and Mid-Cheshire College of Further Education both received a ‘good’ from Ofsted for their apprenticeship provision but are graded as ‘inadequate’ for overall effectiveness – meaning that despite delivering apprenticeships successfully they could still be cut out of gaining levy funding. For Mid-Cheshire, 19+ apprenticeships make up 35 per cent of its Adult Skills Budget, while for West Cheshire, the equivalent figure is 29 per cent. This means that losing the ability to deliver apprenticeships would result in a significant loss of business for these colleges – even though their apprenticeship provision is currently rated ‘good’. A spokesperson for Mid Cheshire College said: “The team here are focused on our PIAP at this stage, working with the SFA and Ofsted to demonstrate clearly how we are addressing the results of our Ofsted inspection. Mark Dawe, chief executive of the Association of Employment and Learning Providers, said: “We won’t oppose it because the priority should be that the register is populated by good quality providers. An option for some grade four colleges looking to avoid being eliminated from apprenticeship delivery may be to merge with another provider that has a higher grading. For example Greenwich Community College, which was rated ‘inadequate’ in February this year, merged at the start of this month with Bromley College and Bexley College which are both rated ‘good’. Analysis of the latest Ofsted statistical release for all FE and skills provider types shows that 18 inspections since the introduction of the new common inspection framework on September 1, 2015 have received a grade four, while 10 (also 12 per cent) have been rated ‘inadequate’ specifically for their apprenticeship provision (see below). This is double the percentage of grade fours given for the provision of ‘adult learning’, which were just six per cent.